The fountain at Dupont Circle in Washington, D.C. The marble fountain was designed by architect Henry Bacon, best known for designing the Lincoln Memorial, and sculpted by Daniel Chester French, best known for sculpting the statue of Abraham Lincoln. The fountain's shaft features carvings of three classical nudes symbolizing the sea, the stars, and the wind. It was dedicated in 1921 and is in honor of Rear Admiral Samuel Francis Du Pont. 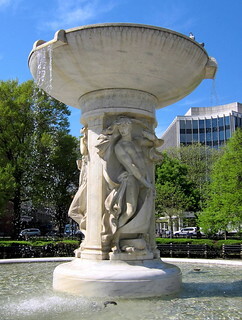 The fountain is designated as a contributing property to the Dupont Circle Historic District, listed on the National Register of Historic Places in 1978. Note: This is one of my older photos I originally uploaded to Wikimedia Commons.